Resident Tommy Lechasseur cleans up near his car after the Chaudiere River flooded, on April 17, 2019 in Beauceville, Que. A Quebec town that this week suffered its worst flooding in nearly 50 years braced for more trouble Wednesday with heavy rain forecast in the coming days. Officials in Beauceville, about 90 kilometres south of Quebec City, said the town hasn’t seen such bad flooding since 1971. “We have a reputation, the people of the Beauce, for rolling up our sleeves, but when I visit merchants, they are struggling a bit. They have tears in their eyes,” Beauceville Mayor Francois Veilleux told a news conference. 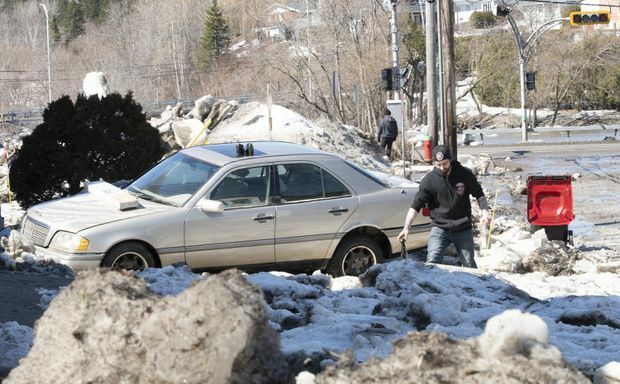 An ice jam that had formed on the river just upstream from the centre of town gave way Tuesday, quickly flooding the town. The water had receded slightly on Wednesday, but was still well above normal levels ahead of rain forecast for Thursday and Friday. Local officials are concerned the Chaudiere River could burst its banks once again. At least 230 buildings were evacuated at the peak of the flooding. By Wednesday, about 120 people were able to return home and roads that had been covered by water reopened. The damage to homes was apparent, and some businesses remained closed. One displaced resident told The Canadian Press as she surveyed the damage that she was ready to move after the latest round of flooding. “I’ve been crying for two days. That’s my motorcycle,” said Sylvie Dufour, who’d just removed the cover from her motorcycle. A large block of ice had landed on the seat and two people were needed to remove it. A day earlier, Dufour had to escape to higher ground because of the rapidly rising waters. She returned to find her car was washed into her yard and her basement was filled with several feet of ice and water, right up to the main floor. She welcomed recent measures announced by the Quebec government that would allow her to move once and for all. “If I get $ 70,000 to relocate tomorrow morning, I’m the first to raise my hand,” Dufour said. Public Security Minister Genevieve Guilbault told reporters Tuesday that an aid program announced by her government this month would have compensation limits. The program makes it easier for homeowners to make claims but also encourages them to move from flood-prone areas. “If they’re ready to give me my asking price for my house, I’ll move, no problem,” said Michel Drouin, a property owner in Beauceville’s downtown area. He was busily emptying his basement full of tools with the help of friends. For now, officials are preparing for the worst. Paul Morin, a Beauceville spokesman, said it’s impossible for machinery to undo the huge ice jam that’s formed because of more ice downstream. In addition to Saint-Joseph-de-Beauce, which is the next municipality along the Chaudiere deemed at risk, other towns downstream including Vallee-Jonction, Sainte-Marie, Scott and Saint-Lambert-de-Lauzon are also on alert. Dozens injured after collapse of deck during wedding celebration in Langley, B.C.